Eliza Krosnic Mitchell was born in Cape Good Hope, South Africa in 1809 on the Elephant River 250 miles inland from Capetown, South Africa. * Although the details are not clear when and how, she ended up in England. Also not clear when, she was married to Rev. John Vandenberg, an Episcopalian Minister for the British Naval Department. After Rev. Vandenberg passed away, Mrs. Vandenberg was left to raise their daughter alone. At some point she was introduced to a sea captain that sailed between New York and Liverpool, England. The man's name was James Comly Mitchell. In 1836, the two were married in Liverpool, and after Mr. Mitchell's sea captain days, the couple settled in the U.S.
Eliza's daughter Hannah K. (from her marriage to Mr. Vandenberg) married Nathaniel Kilborn of Bellevue, Iowa. They named their daughter Florence. Florence's life was also cut short, making it to her fourteenth year. The possibilities of success were greatest in the new frontier and knowing that the new territory to the west of the Missouri River would soon be available for settlement, the couple moved to Council Bluffs, Iowa. At this point, our immediate interest is in Mr. Mitchell's creation and contribution to the town of Florence, which can be read in the page on Mr. Mitchell. As described on that page, Mr. Mitchell passed away, and Mrs. Mitchell refused to allow him to be buried for many months, some say one year. After Mr. Mitchell's death, it is known that Eliza continued to live in the immediate area (Saratoga of Florence Precinct)* (( )) up until at least her 64th year. 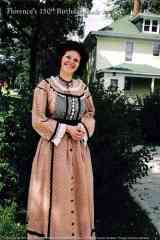 * Census data collected in 1860 list Mrs. Mitchell at 44 years of age, and born in (est.) 1815. It seems reasonable that she knew exactly how old she was at the age of 44. Therefore, it is interesting to note that in the 1880 census, 20 years later, that Mrs. Mitchell had only aged 16 more years. When she should have been 64 years of age per her earlier testament, she listed her age as 60 instead. This is a phenomenon with women's ages that apparently has been going on for quite some time. If Eliza were born in 1809, then her age in 1880 would have been 70 or 71, depending on when in the year the census records were taken. She passed away on November 3, 1881 (or possible 1884*) and was buried in the Prospect Hill Cemetery.